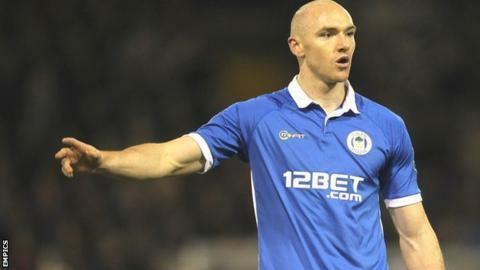 Derby County have signed Wigan striker Conor Sammon on a four-year deal for a fee believed to be £1.2m. Sammon, 25, made 34 appearances for the Latics after signing from Kilmarnock in January 2011, scoring once. Sammon told BBC Radio Derby: "I know he [Nigel Clough] has been chasing me for a while and I'm delighted to be here. "I'm really looking forward to the challenge ahead, trying to help the team and doing well this season. Roll on my first game." The Irishman continued: "I learned a lot from my time in the Premier League. I've got a lot of time for [Wigan boss] Roberto Martinez and the staff there. They looked after me well and gave me a great opportunity. "I look back on my time there with good memories but also some frustration from not playing as much as I would have liked. Ultimately, I've had a great experience in the Premier League. "I've taken lots of positives from my time there and I'm looking to use all of those during my time here at Derby. I'm looking forward to a new challenge, looking forward to getting to know the lads, looking forward to working under the manager, and looking forward to playing in front of the fans." Meanwhile, on a three-year deal for a fee reported to be £750,000.